The Rocky Mountain 5 Plus is a spacious, easy to pitch, family tunnel tent, offering you a comfortable home-from-home in the great outdoors. Featuring our revolutionary BlackOut Bedrooms, with 99% of daylight being blocked out from the bedroom you will be sure to get a great night’s sleep and not wake with the first light. The large living area is spacious enough to take a family table and chairs, it also features large PVC windows with covers, offering the ultimate balance of light and privacy. For easy access and exit the tent has an ingenious full-height door with a drop-down section providing a totally flat entrance, perfect for buggies, wheelchairs and to prevent family members from tripping on entry and exit. The impressive 4500mm hydrostatic head rating on the flysheet combined with the strong and waterproof PE groundsheet will ensure that you stay dry, whatever the weather, and the porch over the door gives shelter while you unzip your tent door. All fabrics are fire retardant and for extra security, the zipper stoppers on the tent doors ensure that zips are always within easy reach in the event of an emergency, even for children. The flysheet is also treated with Coleman’s UVGuard™ providing SPF 50 protection from the sun’s rays. 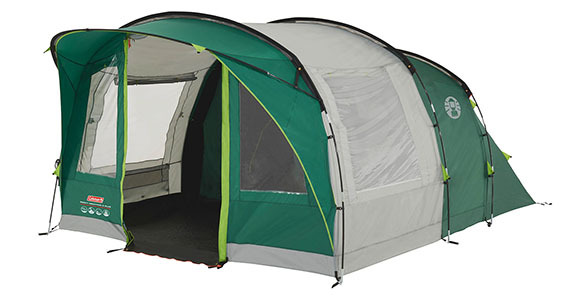 Coleman XXL Bedrooms are designed to be more spacious than the average tent bedroom. Comfortably accommodating our larger double air beds, they offer plenty of space to make your camping trip more enjoyable and helping you get a great night sleep, in the great outdoors!